Just Skirts and Dresses: Marfy patterns dress - muslin 2. Marfy patterns dress - muslin 2. Here are the pictures of my perfected muslin. Looks very 1940's, doesn't it? And it looks exactly like the model drawing! 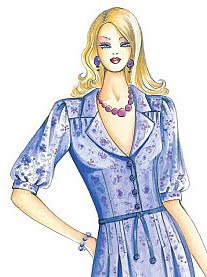 The bodice is not super fitted, although this is not really clear when looking at the drawing. For the pictures I've put on a small belt. So it is visible that the horizontal line between the bodice and the skirt part sits perfect on the waistline. - As for the back, I started with a swayback- adjustment. Now I need to transfer the changes to the paper pattern pieces. One thing that I need to do is to add the same amount of fabric at the bottom of the skirt as the amount I took out in the middle of the skirt back. On the right picture above is clear that the side seam moves towards the back! This needs to be corrected too.